Youngstown State will begin its 42nd season of women's basketball by hosting American on Friday evening at Beeghly Center. The Penguins and Eagles will tip off their 2016-17 seasons at 7 p.m., and the game will be broadcast live on ESPN3/WatchESPN. The Penguins have won 21 games and advanced to a postseason tournament in each of the past two seasons. 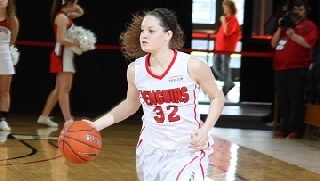 YSU went 21-13 last season and won two games in the Women's Basketball Invitational. The Penguins had not played in back-to-back postseason tournaments in their history prior to last year. YSU returns an experienced group in 2016-17, led by seniors Kelsea Newman and Jenna Hirsch and juniors Indiya Benjamin and Sarah Cash. Benjamin and Cash were both named preseason all-Horizon League, and the Penguins were tabbed to finish fourth. Head Coach John Barnes is in his fourth season at Youngstown State. He has a record of 57-40 over his first three seasons. He ranks third among YSU's seven coaches in wins, and he ranks second in winning percentage. Youngstown State won its first six games in 2015-16, and the Penguins started the 2014-15 season by winning their first 10 games. YSU is 20-4 in regular-season non-conference games over the last two years. YSU made a school record 299 3-pointers and finished 11th in the country with 8.8 3-pointers per game in 2015-16. Advance tickets for Friday night's season opener are available at the YSU Athletic Ticket Office in Stambaugh Stadium. Tickets can be ordered over the phone by calling (330) 941-1YSU. Fans in attendance will receive a schedule magnet, courtesy of 21 WFMJ, Medical Mutual and Rulli Bros. Allow YSU to win its season and Beeghly Center opener for the third straight season. Be YSU's 21st in 25 regular-season non-conference games dating back to the start of the 2014-15 season. Snap a two-game losing streak to American. Youngstown State is 0-2 all time in games played on Nov. 11. The Penguins opened the 2007 season with a 62-53 loss at Buffalo, and the dropped the 2011 opener 69-37 at West Virginia. American finished 8-23 last season with a 5-13 mark in the Patriot League. The Eagles went 24-9 and played in the NCAA Tournament in 2014-15, and they had winning records in eight straight seasons before last year. American was slated to finish fifth in the Patriot League in 2016-17, a two-spot improvement from where it finished last year. The Eagles return four starters from last year's squad, including preseason all-league honoree Lauren Crisler. Crisler averaged 9.2 points and 6.4 rebounds as a junior. Youngstown State is 1-2 in its series with American. YSU's victory came in the first meeting, an 84-77 victory on Nov. 25, 1989. That contest was played in Miami, Fla., at the FIU Thanksgiving Classic. The Eagles won both contests in a home-and-home series in the 2010-11 and 2011-12 seasons. American won 57-41 at home in 2010, and it beat the Penguins 48-41 on Nov. 21, 2011, at Beeghly Center in the last meeting between the two programs. Youngstown State is 23-18 all time in season openers heading into Friday's game against American. The Penguins are 10-6 when they open a season at home, and they are 25-16 in their first home game all time. YSU is looking to win its season opener for the third straight season and for the fourth time in the last five years. The Penguins are also trying for its third consecutive win in a home opener. YSU won 20 of its first 30 openers before dropping seven straight from 2005 to 2011. A 64-50 win over Pittsburgh to start the 2012-13 season ended the skid.